The session for Tuesday, February 12th has been postponed due to inclement weather. Get a good foundation in carving techniques, including push, stop and draw cuts. 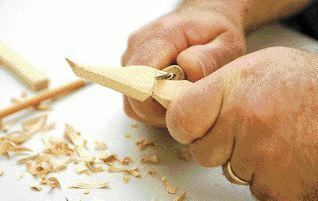 In this three-session class, you will learn the basics of safe handling and use of carving knives the first night, then go on to learn how to deal with changes in wood grain, hollowing techniques, and other concepts as you make a spoon and carve a figure during second and third sessions. This class is open to both beginning carvers and those who already have some carving experience. Each time BARN schedules this class, the carving projects are new. Open to ages 8 and older, although those 12 and under must have an adult with them. No prior experience is needed. BARN will supply carving tools to share, but students are also encouraged to bring their own. You will build your carving skills much faster if you practice between sessions. If you want to take advantage of Open Studio times and our Friday evening Hand Tool Nights, you must first take our free, one-hour Orientation to the Woodshop class. Open Studio and Hand Tool Nights are always free for members. Non-members can also participate without additional charge while working on a class project. Instructor: As a third-generation woodworker, Jeff Iller learned about woodworking tools and knives early on. By high school, he was winning ribbons with his wood carvings at his hometown fair. Around 1996 Jeff found room for a shop and he has carved ever since. He’ll carve most anything, but prefers to innovate with the working tools to carve multiple parts inside one piece of wood and to make physically detailed and accurate carvings of women's faces. Carvings on the entry sign to the BARN Woodworking Studio shows the quality of his work. Iller says he was taught early on that he could make anything from wood. He is still trying to prove that statement wrong.